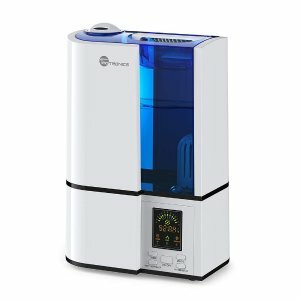 Amazon.com offers the TaoTronics TT-AH001 Cool Mist Ultrasonic Humidifiers Quiet Operation, LED Display, 360° Nozzle, Waterless Auto Shut-Off 4L for $32.99 via coupon code DVHZNUXH . Features: In a cold and dry winter, our skin is losing water every minute. To breathe healthier air, you will need a humidifier from time to time. This TT-AH001 is one of the Top 3 humidifiers on Amazon. You can put it wherever you are, it’s perfect for bedroom use thanks to the sleep mode. You can adjust the mist levels and set it on timer. With a 4L/1.06 Gallon tank, you can get 12 to 30 hours’ humidified air with one fill. It’s whisper-quiet during operation for better sleep at night. There is a ceramic filter and low water protection for safer and better use. Note: Please do NOT use with essential oils.